The meltimi winds finally subsided after ten days, so we left Leros and motor-sailed on to Patmos. We thought that having waited an extra day before leaving the seas would have laid down more. We may have been a day too soon. The seas were roughly 1-1.5 meters and only about 3 seconds apart, making for a lumpy passage. It is amazing that even in the high winds of a meltimi, the sun shines brightly from cloudless skies. There has been no rain, and there is none in the foreseeable forecast. There is, however, another meltimi in that forecast! Patmos is the northernmost island in the Dodecanese island chain. From a distance it looks like two lumps of rock connected in the center by an isthmus, with traditional white Greek homes cascading down one hillside into the village of Skala, the island’s capital. 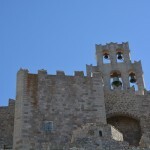 The focal point of the island, resting at the top of one hill, is the monastery of St. John the Divine. Part way between the monastery and the village below is the Church of the Apocalypse with the cave of St. Anne. 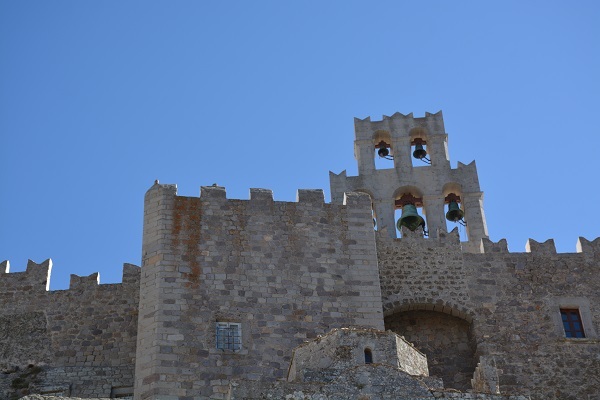 In 95 AD, John was exiled to Patmos where he wrote the Book of Revelations at the cave. Every year now thousands make the pilgrimage to the island to see the site where St. John lived and wrote. The monastery (1088 AD), still active since its construction a thousand years ago to commemorate St. John, has detailed fresco paintings and a museum with original documents and art work. 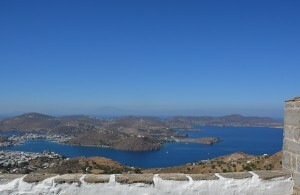 The 360 degree views from the monastery are spectacular, with bays and small beaches close by, dotted with tiny rock islands and the larger islands of Greece in the distance. 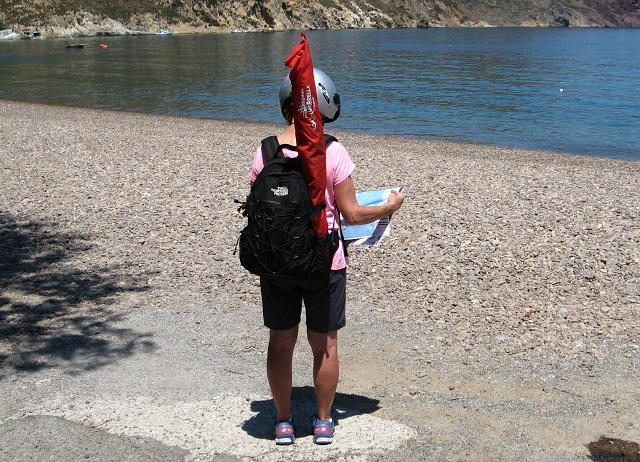 We rented a scooter to find all the small beaches and check them out. On the north coast is Lampi beach which we were told had “colorful stones”. They were not kidding. The beach was nothing but stones and the most unusual colors and variations within each one. To add to their interest, the stones were smooth from being tumbled by the waves. Did we want to collect some? Yes, but the sign clearly stated both in Greek and English that it is illegal to take any stones and they would prosecute. We left the stones alone but took something else from the beach instead. As we arrived at the beach, enjoying one gorgeous view of the bay after another as we zig-zagged our way down to the water, we noticed a strange reflection on the water. Was it trash? 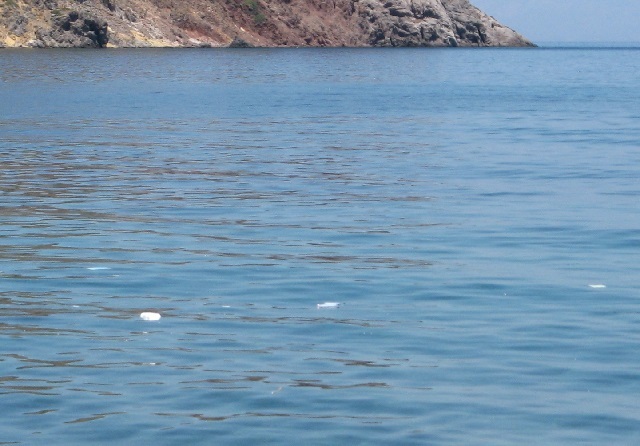 How could this beautiful beach with crystal clear water have trash floating about? It was not an overwhelming amount of trash and it had not yet landed on the beach—just hoovering in a tight radius. 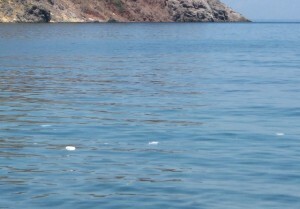 We set up our towels and umbrella, and while we sat to contemplate the unfortunate situation we noticed a Greek couple swimming from one piece of litter to the next collecting it in a makeshift bag. Realizing no one else was going to help we donned our bathing suits and jumped in. In 15 minutes we had the entire gyre of trash contained in bags on the beach. It turns out the other people were not locals as we thought, rather well intentioned tourists from Athens. They were equally disgusted by the scene and after reflecting on the sorry state of plastic waste in the world we parted company fulfilled by having made a dent in the problem–minuscule dent but never the less it was the effort that mattered. 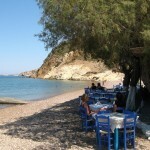 We proceeded to enjoy the views from the beach and taverna along the water comforted by the thought we had done our part. 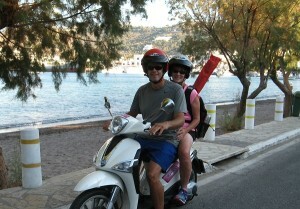 Scootering back through town in the center of the island we headed to the southern shores and the beaches at Grikos Bay. 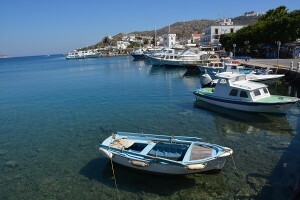 One of the Patmos tourism magazines said it had been named one of the most beautiful bays in the world. That did get us to go check it out, but they did not happen to name the source of the honor. It is beautiful with two islands edging the bay and a nice beach for swimming. While we would not put it in our top ten we did enjoy a swim in the clear water and some good people watching. Back at the boat we read the news that a coup d’état was under way in Turkey. We spend hours into the night trying to follow the events through SSB radio and the internet and checking in on friends we have in Marmaris, where Erdogan was when the coup began. Everyone is ok. Over the past year we have been told by many people in Turkey that their democracy is a sham and the government corrupt. The environment was ripe for a coup. Had the coup succeeded it would have been a messy situation for a long time with uncertain outcomes. We were not rooting for the coup but felt great sympathy for all those that felt so strongly that they were willing to put their lives on the line for the chance at fixing their country. Unfortunately, for the thousands that did there will be very severe consequences. No doubt the current government will want to make an example out of them to send the message to everyone else. Although the coup has failed, it is our hope that the current government will take it as a message and allow democratic changes reflecting the will of the people. Wishful thinking! 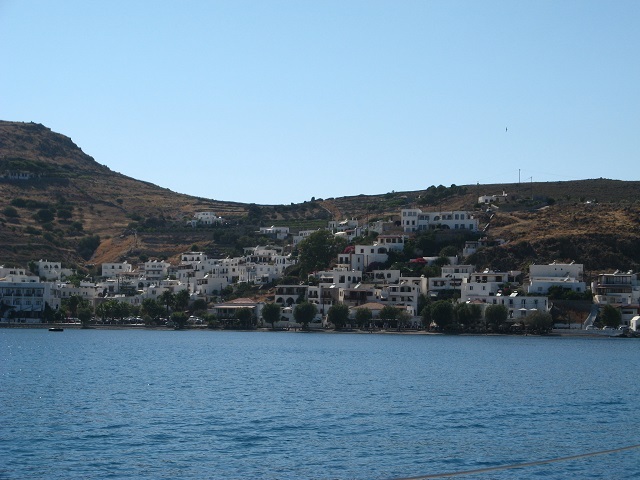 Patmos is now one of our favorite islands in Greece. Greener than most islands and with picturesque bays, it also has a large and lively town square of good shops and restaurants. This entry was posted in 2016 Turkey / Greece Cruise, BLOG. Bookmark the permalink. Great photos and article. I would love to visit Greece.